As the rain barrel trickles and the sun beats down on the garden we embrace the bounty and shape our meals around its supply. June brought heaps of garlic scapes, lettuce, salad mix and more. 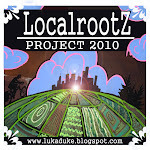 To get caught up I will just share some sights and captions from June at the localrootz homestead. A classic slug view of the lettuce sizing up along with some broccoli in the background and peas in the foreground. The high mowing mesclun mix had great germination and kept providing us a delicious blend of greens with ample mustard greens mixed in. Everything always has such great order in the beginning of the season. Here Im cutting some Tat Soi, which is an asian green that comprised my favorite salad. Straight Tat Soi mixed with sliced radish and a ripe avocado then garnished with ginger miso dressing and a few spoonfuls of crushed raw cashews ! Watch that lettuce and chicory mix fill in. After the first round of Tat Soi had finished and its neighboring spinach which never really was much of a success due to the quick burst of heat that hit this June we decided to plant a handful of bush beans. Along with the bush beans we had planted some beets that were now filling in and behind those the gem of the spicy greens this season made its appearance. This powerful green packed a punch that was not for the faint of heart but myself being a flavor hound I found it to be the most complex and interesting green I have ever tasted. So peppery and green at first but then the heat of mustard seed creeps and mingles with pungent anise, cinnamon and mint that evolve on the palate. I passed out some of this to friends and family and some people had a similar experience as I did but others will now be cautious of anything I offer up for an extended period of time. Crinkled Cress... check it out! It was most pungent at this stage when it was just forming flowers but I found a quick sauté tempered its pungency ! Broccoli is beginning to form some crowns. Beans are up. On the left are the Dragon Langerie and on the right some Royal Burgundy. The "flux" bed in full swing with peas climbing... I call it flux because it gets the most rotation through the season and always has something ready to eat and other things just starting to sprout. Our middle bed is filling out nicely as well with lots of different hot and sweet peppers on the left, a row of celery, rainbow chard, shallots, collards and finally some kale. So many unique peppers including some Shishito, Habenero, Ghost, Biscayne and more. Little seedlings in bed finding their roots. Eggplant, Brussel Sprouts, Cabbage and Summer Squash. Another quick project was wrapping the lawn edge of the newly planted asparagus bed with some leftover weedblocker... just a foot wide strip pieced together and piled over with some leftover fieldstones piled up. The asparagus has its fern growing out and establishing a good root system that hopefully will be the start of a long stretch of asparagus on our spring plates for many years to come. Tomato bed all planted, I also spaced some mixed basil seed along the edges and planted a couple cucumber plants along with some jamaican sour gherkins. A typical dinner at the homestead starts with a quick trip outside the kitchen door to our garden. Garlic Scapes, Herbs and Collards. Grilled Herb Chicken Breast served over new potatoes, with corn, collards and scapes. All from Maine with the exception of the corn which isn't around just yet.